LAS VEGAS (AP) - More than a week after the deadliest mass shooting in modern U.S. history investigators are stumped about the key question: What led a 64-year-old high-stakes gambler to kill 58 people and wound hundreds of others at a country music concert? It's an answer they may never find. The FBI and Las Vegas police have sorted through more than a thousand leads and examined Stephen Paddock's politics, finances, any possible terrorist radicalization and his social behavior. By Monday they had repeatedly searched his homes and interviewed his brother, girlfriend and others he's done business with. 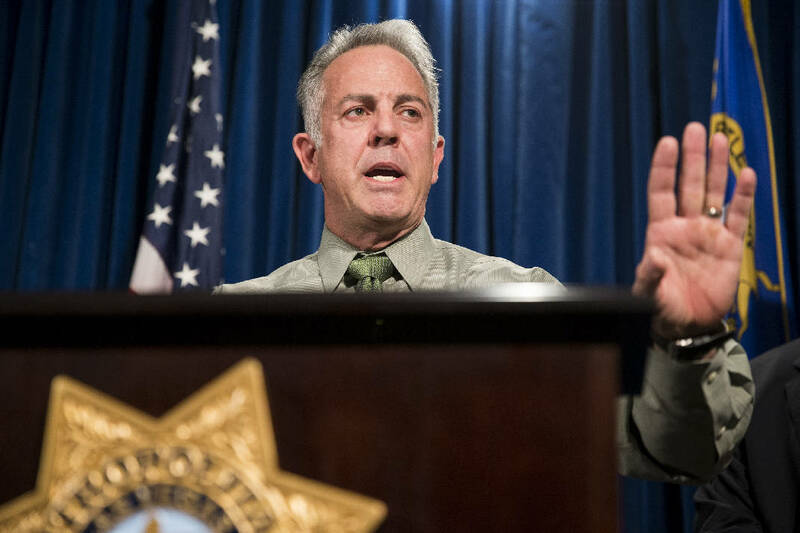 "This individual purposely hid his actions leading up to this event and it is difficult for us to find the answers to those actions," Clark County Sheriff Joe Lombardo said Monday, conceding he's frustrated. The FBI has brought in behavioral profilers as they continue questioning Paddock's live-in girlfriend, Marilou Danley, about his gun purchases and what she may have noticed about his behavior, Lombardo said. The sheriff changed the timeline of the shooting Monday, explaining that a security guard in the hotel's hallway responding to a report of an open door heard drilling from Paddock's room. Paddock, who had installed three cameras to monitor the approach to his suite, opened fire through the door, spraying 200 shots down the hall and wounding the guard, who alerted other security officials. Previously the sheriff had said the guard's arrival in the hallway may have caused Paddock to stop firing. He said Monday he didn't know what prompted Paddock to end his deadly gunfire. Paddock's life has remained somewhat of a mystery and most people who have interacted with him said nothing really stood out about him. "It's his actual normalcy that makes him a fascinating study," said David Gomez, a former FBI profiler. The small group people who knew Paddock well has said the one-time IRS agent and the son of a notorious bank robber did essentially nothing except gamble, sleep and travel between casinos. Investigators are sifting through every piece of Paddock's life from birth to death, Lombardo has said. "Every piece of information we get is one more piece of the puzzle," the sheriff said Monday. The FBI is working around-the-clock and a "comprehensive picture is being drawn as to the suspect's mental state," the sheriff said. Though at this point, they haven't found any one particular event in Paddock's life that triggered the shooting, he said. But even as investigators work to try to figure out what might've led Paddock to commit the shooting, there may never be a clear answer. "Sometimes there isn't an understandable explanation for why someone commits a horrific crime," Gomez said. After the shooting, police found a piece of paper on a nightstand in Paddock's hotel room that contained a series of numbers that helped him calculate a more precise aim, accounting for the trajectory of shots being fired from that height and the distance between his room and the concert, a federal official said. The official wasn't authorized to discuss the details of the ongoing investigation publicly and spoke to The Associated Press on condition of anonymity. "The reason you want to engage in an attack is you want to be promoting your extremist ideology - you want publicity," said Erroll Southers, director of homegrown violent extremism studies at the University of Southern California. "You want people to be afraid of what you believe and what you do." But although most killers may want to take credit for their act, Paddock might have reveled in the riddle he's presented for investigators, Van Zandt said. "He may even find some solace knowing that, 'I've left so few footprints, they're going to have a helluva time figuring out who I am.' And that, in his challenged mind, might bring him a terrible level of satisfaction," he said. Despite the absence of easy answers, investigators may still be able to fill out a portrait of Paddock's mindset in the coming weeks, Van Zandt said. "Instead of a eureka moment, I think what investigators are doing is they're putting an ounce of information at a time on the scale," he said.